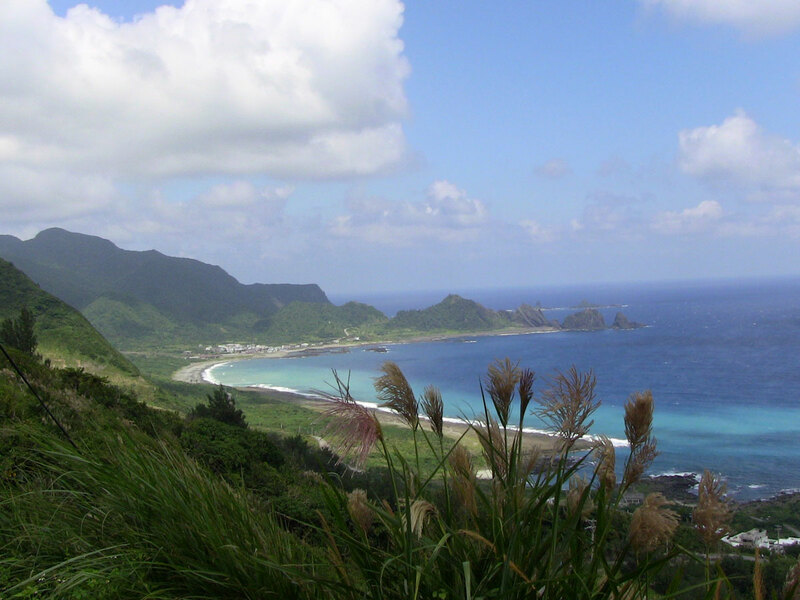 The island known in Mandarin as Lán Yǔ (蘭嶼 / 兰屿) has a lot of different names, including Orchid Island, Ponso no Tao, Pongso no Tawo, Irala, Tabako Shima, Tabaco Xima, Botol, Buturu, Kotosho, and Botel Tobago. 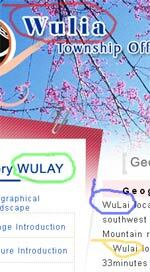 In texts in the roman alphabet, most of the time it’s referred to as “Lanyu.” That’s how I’ve written it in the past. 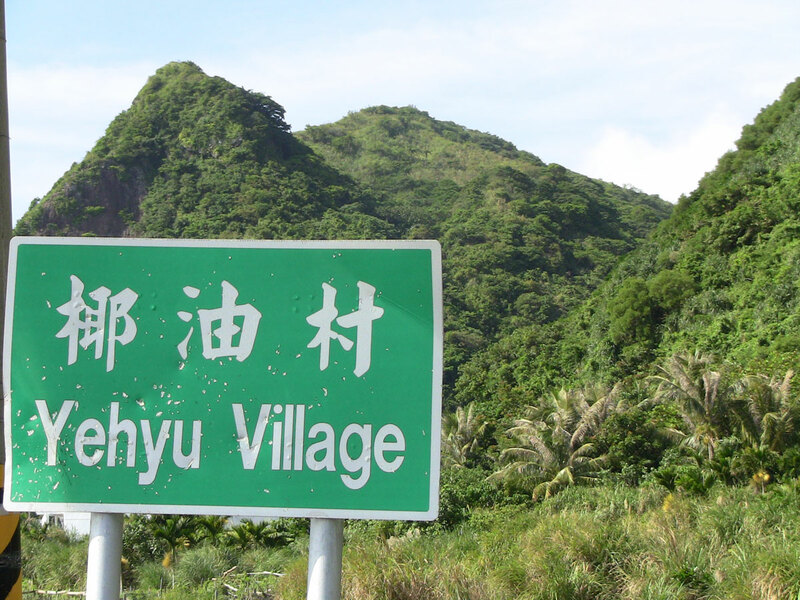 But the Xinhua Pinxie Cidian (p. 21) gives such island names with the yu separate, so I’m going with the Pinyin standard from now on. Anyway, there are plenty of names for this beautiful place off the southeast coast of Taiwan. But it doesn’t have much in the way of official signs. 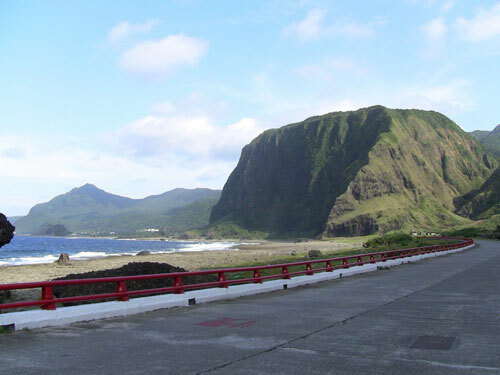 In large part, that’s because it doesn’t really need many, given the fact that the entire island has only a couple of roads: a ring around the island and another cutting over the mountains, plus a few minor side roads, some not much larger than a sidewalk. 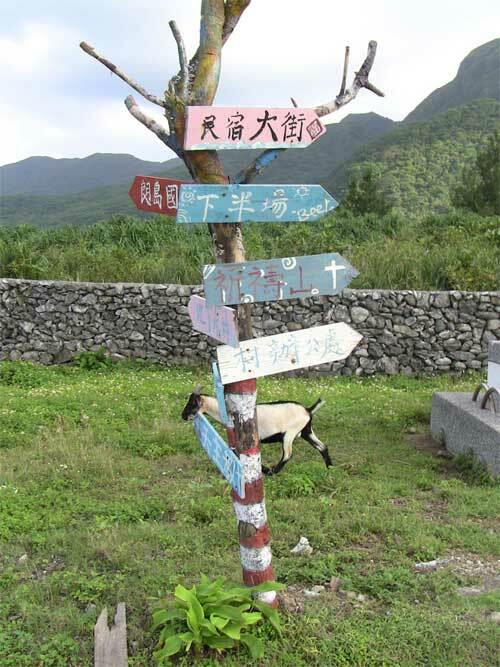 It’s not overrun with tourists; and the inhabitants certainly don’t need any signs to tell them where they are or to keep them from getting lost. In one village I found an official sign (but not one for a road) that had been appropriated for part of a wall on someone’s house or shed. This would, of course, have made for a great photo; but circumstances were such that I probably couldn’t have taken the shot without seeming disrespectful, so I passed the opportunity by. 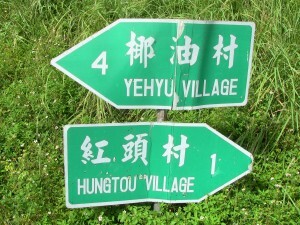 “Yehyu” and “Hungtou” are both in Wade-Giles. 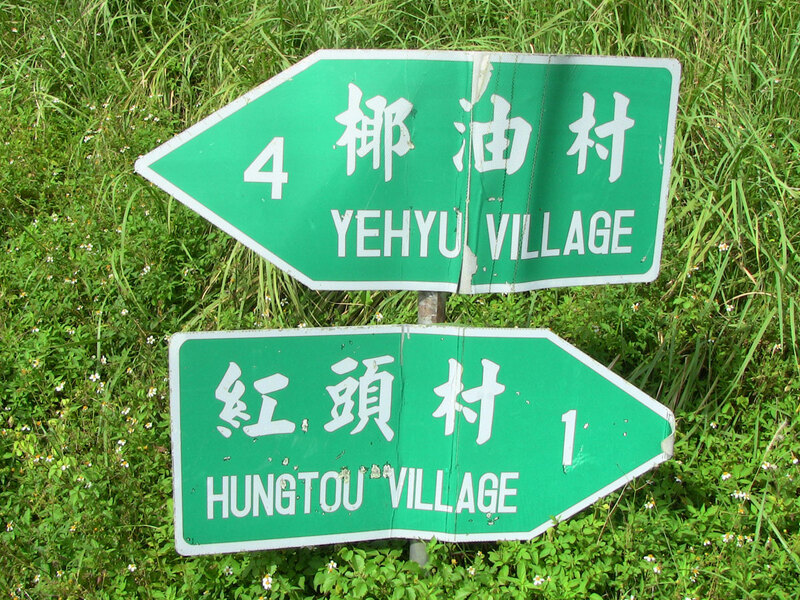 These would be Yēyóu Cūn and Hóngtóu Cūn in Hanyu Pinyin (and Tongyong Pinyin and MPS2 — though with the tone marks indicated differently) — for the Mandarin version of the name. 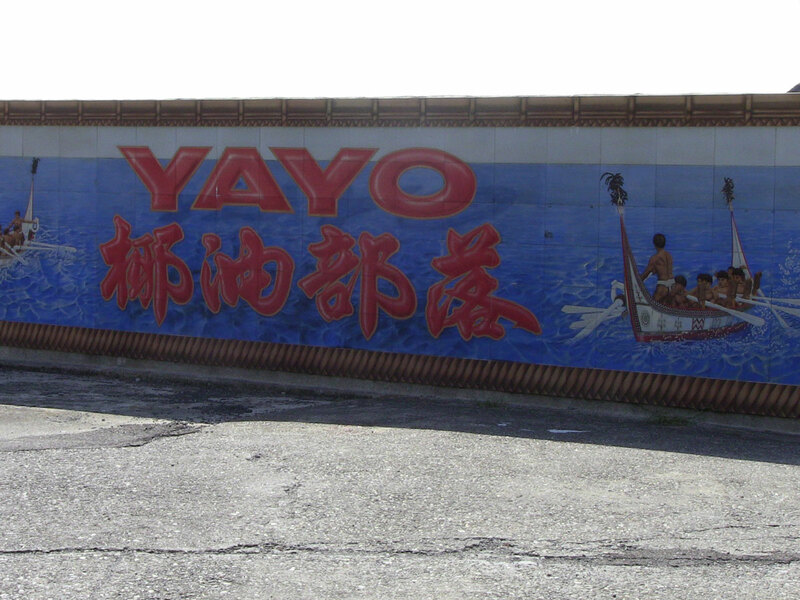 But Yayo appears to be the Yami name. The sort of marker shown below is fairly standard. 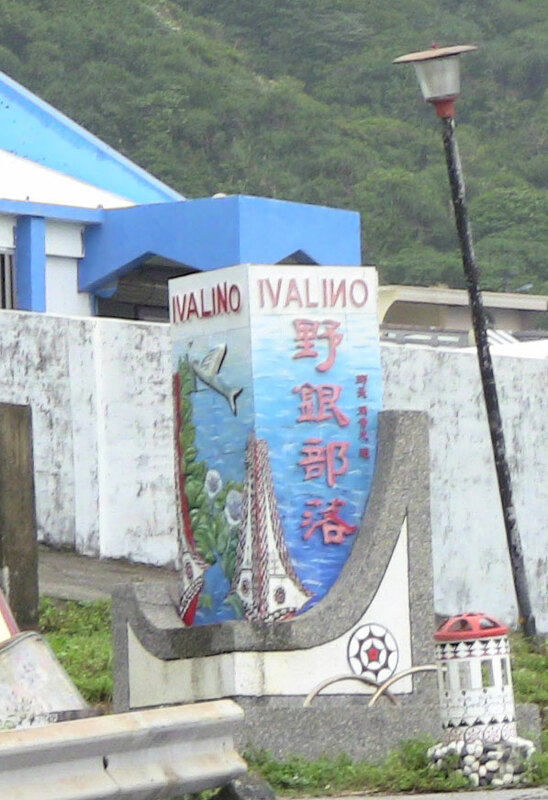 Note that the name in roman letters (Ivalino) is not a romanization of the Mandarin form (Yěyín Bùluò / 野銀部落). Note also the backward N, which is a mistake, not a special letter. 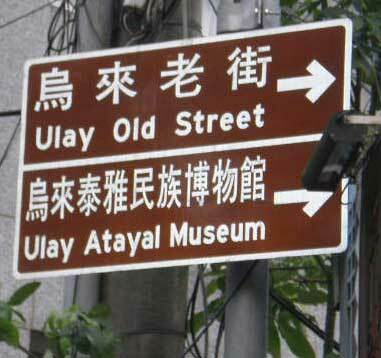 This photo perhaps best captures the nature of signage on Lan Yu — when there is any signage to be seen, that is. 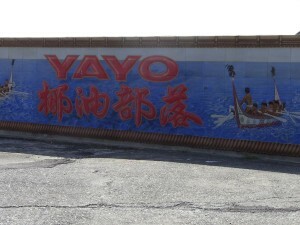 I was saddened when I was there to hear children speaking only Mandarin with each other rather than the Yami language. But perhaps those I heard weren’t a representative sample. A Catholic church in Jinlun (Jīnlún/金崙), Taidong, Taiwan. Note the absence of Chinese characters. The town of Jinlun being in an area with many members of the Paiwan tribe, I checked with a Chen Chun-Mei (Chén Chūnměi / 陳春美), a Paiwan specialist at Guólì Zhōngxīng Dàxué (National Chung Hsing University / 國立中興大學), who wrote that kiokai is one of many words Paiwan borrowed from Japanese (kyōkai/教会: meaning church), and that ni in Paiwan means of or by. 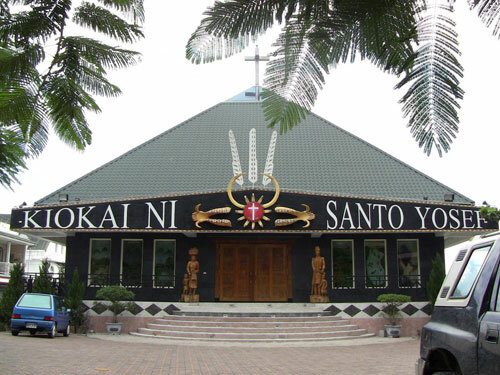 So this is the Church of Saint Joseph. I was also interested to hear on the train to Jinlun that some of the announcements in advance of some stations in Taidong County were in not only Mandarin, Taiwanese, and English, but also an aboriginal language. I’m guessing Paiwan. Even in the announcements in that language, however, the place names themselves sounded like they were given in Mandarin forms, though the descriptions were not. During my recent trip to Wulai (Ulay in Atayal) I was pleased to see at least a few signs in the Atayal language. This one — no Chinese characters! no English! — appears on the fronts of several stores on the Old Street that have water from hot springs piped into tubs there. I asked a couple of shop owners about this. 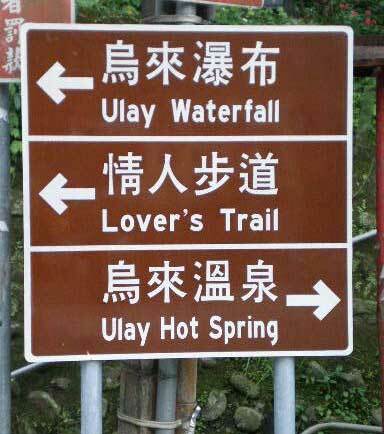 They clearly had only vague notions about the signs being for hot springs; they couldn’t read the signs themselves. This sign takes the form of personal pledges for a healthy lifestyle. Most have to do with [not] drinking. Gaga is the Atayal word for traditions/customs/rules (especially those handed down from their ancestors). 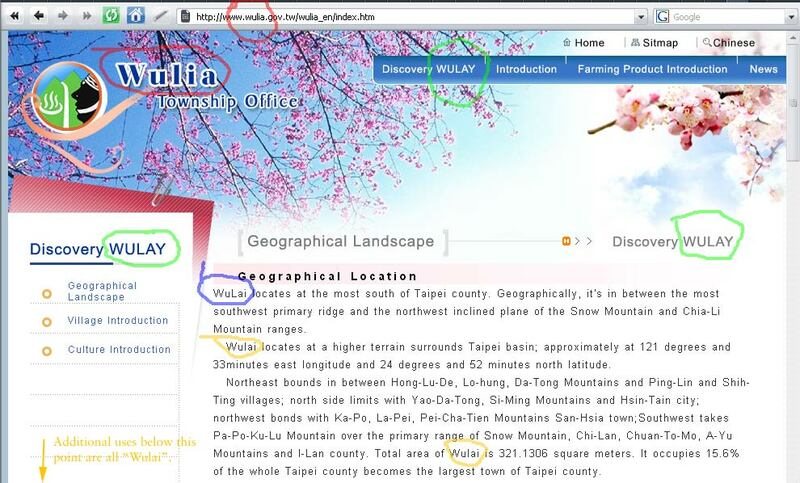 Rather, it is from a language spoken in Taiwan hundreds of years ago. Chen said giving the major road an Aboriginal name was inspiring and symbolic of the trailblazing spirit of the Aboriginal tribes known as the Pingpu. 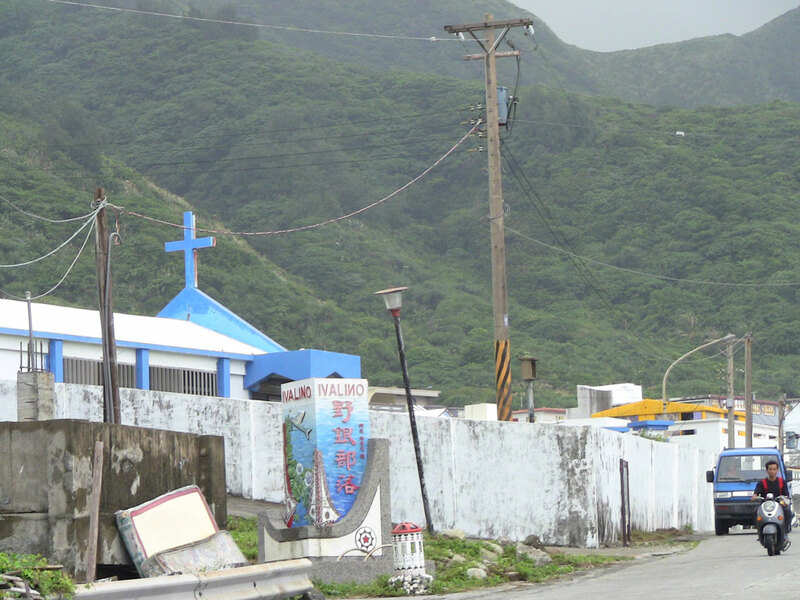 Authorities chose the name “Tackalan” because the new road crosses Anting Township (安定), which Dutch colonizers called by the Aboriginal name. Note: “Anting” is bastardized Wade-Giles. The proper spelling — in Hanyu Pinyin, as well as in all of Taiwan’s official romanization systems for the last twenty years is Anding (Āndìng. Centuries ago, Tackalan was a thriving river-fishing location populated by Aboriginals. It gradually grew into a farming village as the river became congested with silt…. Another of the three major roads [around the science park], Baccloangh Boulevard, is open to traffic, while the third, Siraya East Road — named after a Pingpu tribe — is under construction. For the spellings in romanization I’m having to take the CNA story’s word for it, which is often not a good idea. I do not know what the street signs themselves look like. The new guidelines from the Ministry of the Interior, however, do not make me confident that the spellings will follow those of the original languages. (They give, for example “Kaidagelan Boulevard” — a romanization of the Mandarinized 凱達格蘭大道 / Kǎidágélán Dàdào — rather than the proper “Ketagalan Boulevard.”) Thus, the signs may well give Mandarinized forms in Tongyong Pinyin (i.e., not Tackalan but Jhijianong, not Baccloangh but Mujialiou, and not Siraya but Silaya). I’d greatly appreciate pictures, in case any readers are ever in that area. 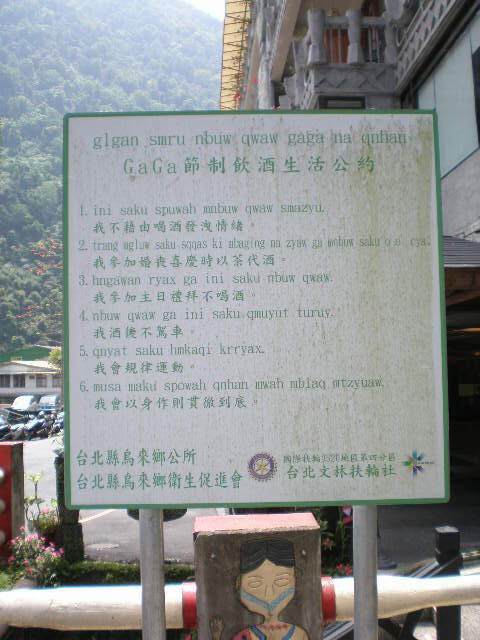 As of January 2007, only 6,613 of Taiwan’s 470,000 Aborigines had officially registered to use their original names (i.e., those in the languages of their tribes, rather than the Sinicized forms that were forced upon Taiwan’s aboriginal population until relatively recently). This low rate, combined with the realization that the procedure was inconvenient for those who had moved away from their home towns, prompted the government to simplify the registration procedure by allowing people to register their names at any household registration office, not just the one for their officially listed household. This has been effect since April 1. Names may be registered in a variety of forms: with Chinese characters, romanization, or a combination of both. Yuánzhùmín shēnqǐng huífù chuántǒng míngzi de shǒuxù, jírì qǐ kěyǐ gèng fāngbiàn, cóng jīnnián 4 yuè 1 rì qǐ, bùzài yìngxìng guīdìng zhǐnéng huídào hùjí de bànlǐ gēngmíng shǒuxù, chūwài qiúxué jiùyè de yuánzhùmín zài rènhé yī ge hùzhèng shìwùsuǒ dōu kěyǐ bànlǐ gēngmíng. 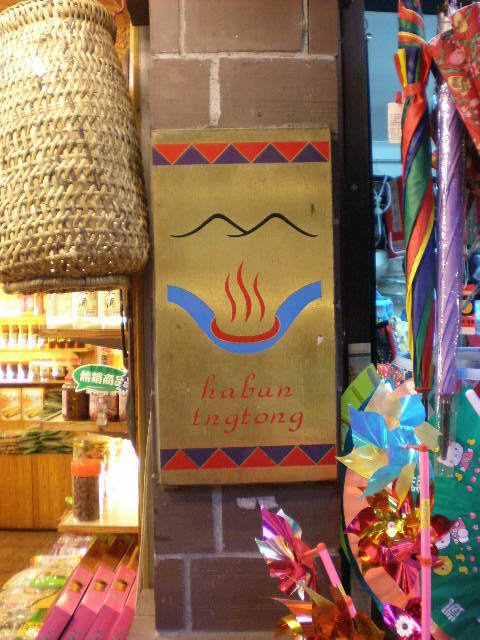 Gēnjù Yuánmínhuì [Yuánzhùmín Zú Wěiyuánhuì] de tǒngjì: zhì 96 [i.e., 2007] nián 1 yuè zhǐ, yǐjing huífù chuántǒng míngzi de yuánzhùmín jǐnyǒu 6,613 rén, yǔ yuánzhùmín zǒngrénkǒu shù 47 wàn duō rén xiāngjiào, bùdào bǎi fēnzhī yīdiǎn wǔ, bǐlì fēicháng dī. Hěn yǒu kěnéng shì wèile jiùyè, jiùxué huò qítā yuányīn, líxiāngbèijǐng dào dūhuìqū dǎ pīn de yuánzhùmín yùláiyù duō, ér jiù guīdìng shēnqǐng huífù chuántǒng míngzi, yīdìng yào huídào hùjí suǒzàidì de hùzhèng shìwùsuǒ bànlǐ, ràng bùshǎo yuánzhùmín dǎ tuìtánggǔ. Xīn guīdìng xiūzhèng hòu, yuánzhùmín shēnqǐng gēngmíng zài gèng de dōu kěyǐ bànlǐ.